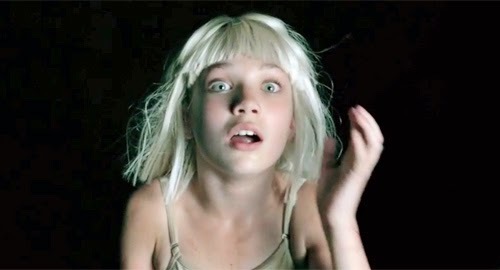 Over the last year, 12-year-old dancer Maddie Ziegler has become the public face of Sia, appearing in the singer's trademark blonde bob in the videos for Chandelier and Elastic Heart. The pair's collaboration began when Sia reached out to the youngster on Twitter, having seen her on the reality TV show Dance Moms. "She said she wanted to meet me and she wanted me to dance to her song," Ziegler told Pigeons and Planes. "She was pretty much telling me how she doesn't want to be famous. She wants to be known for her songs, but she doesn't want to really show her face anymore... It was so cool." Ziegler's stage directions for that first video were "to be overdramatic," she recalled. "So there I am crazy eyes and everything." The clip for Chandelier is certainly unnerving, and Ziegler took the crazy up a notch when she starred alongside Shia LeBeouf in Elastic Heart. "It was such a big change for me, because I’m not used to doing that style in normal dance competitions," Zeigler told EW. "It was definitely very different for me, but I love being able to do that kind of style." Now she's at it again, in the video for Big Girls Cry - which is being billed as the final act in her Sia trilogy. This time, the camera is (mostly) locked off on Ziegler's face - which once again conveys the turmoil of Sia's inner monologue in deranged, demented detail. Don't watch it before you go to sleep.